Native American traditions and knowledge is being lost forever. Join us in helping keep this valuable resource alive. Tribal Traditions is working everyday to provide the needed resources and education to make this happen. Pine Ridge Reservation is the poorest nation int the US and was built on broken promises. It is a third world country right in the middle of North America. The Lakota people live in dire poverty and the unemployment rate is a staggering 95%. There are very few jobs on the Reservation and the majority of families are bound to the welfare system that gives them just enough to stay alive. The housing crisis on Pine Ridge is real, about 90% of families live in substandard dwellings, most of which would be considered "condemned" outside the reservation. Many families live without heat and rely on a single wood burning stove inside dilapidated trailer homes without running water and proper plumbing. Our goal is to build a permanent aircrete teepee and teach the Lakota community how to harness the power of this incredible building material to address the housing crisis on Pine Ridge from within the community. Aircrete often called a "building material of the future" is known for being a sustainable material that is stronger than concrete, is fireproof, waterproof, insect resistant and much lighter than concrete because it is mostly made of air. We are half way finished with a small aircrete teepee prototype and plan to have it completed by summer 2019. This gift holds a seed of great healing for the United States, symbolically offering the original wisdom keepers of Turtle Island modern eco building techniques and a prototype of a 1000 sq. ft. structure designed with traditional native wisdom and the intention to bring solutions to the Pine Ridge housing crisis that connects tradition with the modern age. No matter how small the act begins, we believe this metaphor will be far reaching! We work closely with many Lakota families who are preserving the traditions and uplifting the Lakota People from suffering. This year we are highlighting the efforts of Dave Swallow and his wife Nyla Helper. David Swallow Jr. is a Teton Lakota living in Porcupine South Dakota on the Pine Ridge Indian Reservation. David and his Grandfathers are from the Band of Crazy Horse. He is known as a spiritual interpreter, Sundance Chief and one of the Heads man for the Lakota, Nakota, and Dakota Nations. 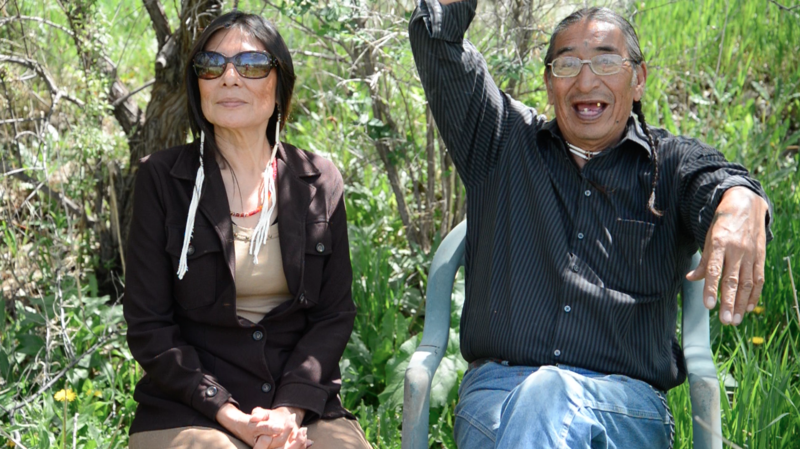 He is one of the last fluent Lakota language speakers, both the old language and today’s Lakota language. On his father’s side, he descends from Chief Standing Buffalo and from his mother’s lineage Chief Red Shirt. David’s Lakota name is Wowita Uha Muni, which translates as Walks With Pride. His wife, Nyla Helper’s Lakota name is Mato Wi which translates as Bear Woman. She crafts traditional Lakota medicine for the people. The only income they have is Nyla’s beadwork and what other people offer to them. They receive NO help from the federal government, Bureau of Indian Affairs, or the Oglala Sioux tribe; NO food stamps, NO welfare assistance of any kind, but still they are keeping the Lakota ways alive. We will soon be relaunching the Tribal Traditions online store where you will be able to buy the powerful Lakota Star Quilts and learn how to honor others with this traditional gift of generosity.